Ned Kelly’s armour, rifle and death mask are leaving the State Library today and will be on loan to Bendigo Art Gallery until 8 July. These are key pieces in our historic collection – Ned’s bullet-dented armour is a particularly popular item in our permanent exhibition devoted to Victorian history, The changing face of Victoria. The pieces will feature in the exhibition Imagining Ned, which explores the history and mythology of the Kelly Gang and is on at Bendigo Art Gallery from 28 March to 28 June. We regularly loan collection items to regional galleries and libraries as part of our charter to make the collection accessible to all Victorians, including in regional Victoria. 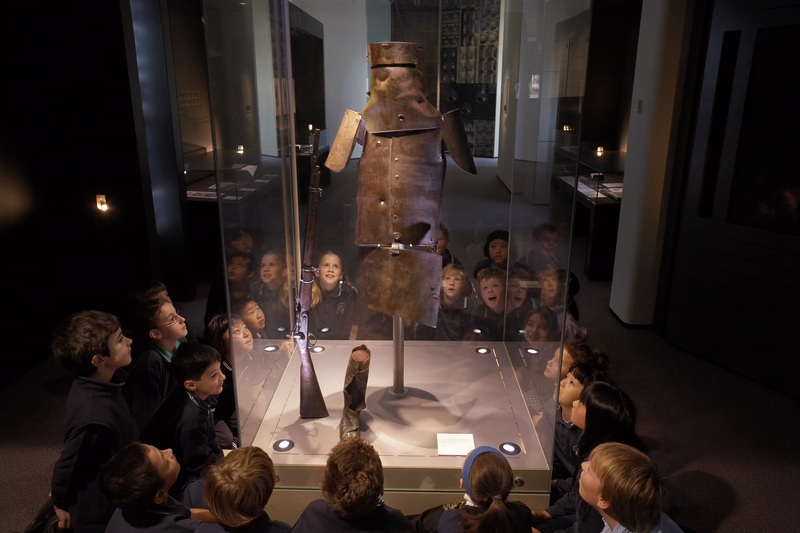 A printed acrylic replica of the armour will be in Ned’s display case while the original is away and Ned Kelly general tours and school tours will continue to run during this period. The pieces will be back on display in the Library from 8 July. There is still plenty of rare and extraordinary Ned Kelly material to see in The changing face of Victoria exhibition, from the famous Jerilderie Letter and eye-witness photographs of the siege of Glenrowan, to film stills of Mick Jagger’s cinematic portrayal of Australia’s favourite bushranger.